1862 – 1867 - studied at the French School in Istanbul, the School of Commerce in Vienna and at the higher School of Finance in Paris. Leader of the Secret Revolutionary Committee after his return to Svishtov. Took part in the organization of the Second Bulgarian Legion. Correspondent to French and German newspapers during the April Uprising. MP in the Constituent Assembly. MP in the Grand National Assembly. 1879 - Minister of Finance in Burmov's cabinet. 1879 – 1880 - Minister of Internal Affairs and Financial Administration in the government of bishop Kliment. 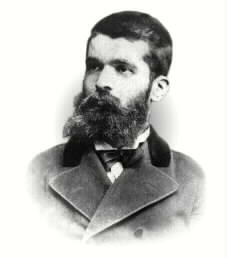 1881 – 1882 - Minister of Internal Affairs in the sixth cabinet of the Principality of Bulgaria. 1883 – 1884 - Minister of Finance in the governments of Tzankov. 1885 – 1886 - Diplomat in Bucharest. 1886 – 1887 - Minister of Finance and Religions in Dr. Radoslavov's cabinet. 1887 – 1888 - Minister of Finance in Stambolov' s cabinet. 1890 – 1891 – Diplomat in Vienna. 1891 – 1892 - Minister of Finance in Stambolov' s cabinet. 1894 – 1896 - Minister for Foreign Affairs and Religions in Dr. Stoilov's cabinet. 1899 –1900 - Minister of Labor and Agriculture in the governments of Grekov and Ivanchov. 1903 – 1906 - Diplomat in Istambul. 1913 - Led the talks on the setting of the relations between Bulgaria and Turkey.